Click on any of the links to register or get more information about the wonderful speakers, their topics, or the schedule. The telesummit includes talks by Alan Brown (ADD Crusher), Rick Green (TotallyADD), Tara McGillicuddy (ADHD Support Talk Radio), and Dr. Charles Parker (Neuroscience Consultant and Psychiatrist) among others. I will be speaking about ADHD-Friendly Goal Setting on Friday, July 21 at 3pm Pacific / 6pm Eastern. You can listen by phone or online to each of the 20 calls FREE at the scheduled call time and you’ll have access to the replays for 24 hours after each live call.Interested? 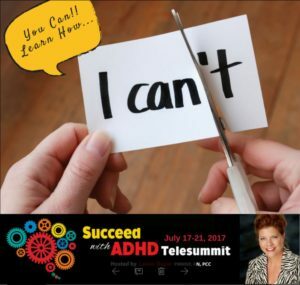 Be sure to save your seat at Succeed with ADHD Telesummit. And if I can be of assistance to help you or a loved one succeed more easily with ADHD, I would love to hear from you.